Everyone has an opinion about how to raise children, even those without them. The fact is, no two kids are the same so the experience of raising children will not be the exact same for parents. Some kids will listen and some will not, some kids will be calm and still and others will not, and some kids will need more vital guidance than others. 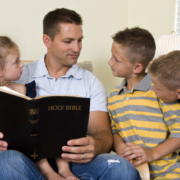 The Bible is one of the best resources we have for how to raise children. Not only does it provides vital guidance about parenting children, but it also provides guidance for being a parent. The child-rearing experience will still be different for parents but the Bible helps with their responsibility to teach a good foundation for children to thrive in the world. “Train up a child in the way he should go and when he is old, he will not depart from it” comes from the Book of Proverbs. There are a few different ways people view this verse from raising a child based on his or her talent to growing the child up in God’s Word for character and a relationship a with Him. The latter view sees a relationship with God as more important than earthly talents. However, the overall goal would still be to have a child with godly character who still thrives to be the best at his or her talent(s). There are also verses about “children obey your parents” and “Fathers do not provoke your children to anger but bring them up in the nurture and admonition of the Lord” in the Books of Ephesians and Colossians. At times, it’s a natural response to be upset with children when they do not listen or have intentionally damaged something that was important to you. However, that is when parents must fall on the vital guidance of the Fruits of The Spirit to parent in a way that is comforting and safe for children to learn from their actions. In the end, parents will see it was just stuff that was not more important than their relationship with their children. There is no guarantee how children will turn out as they grow up, but parents still have a responsibility to teach them right from wrong. If you do this based on varying opinions of others then your children can’t explained why their beliefs are what they are because they were never a solid foundation. They were just the opinions of others that can readily change based on how they are feeling that day. Today, there are many ways to learn those words. Reading, audio as well as Bible videos are available in many languages as well as at our fingertips because many of us have mobile phones. So the next time you’re in the comfort of your home, traveling or relaxing before bedtime, read or listen to a few verses for knowledge of how to train up a child.